I don’t claim to be any type of expert on anything, really. My knowledge of cows is first hand and personal, but not what I’d call comprehensive or authoritative. Based on the questions people ask about the Ladies, it’s clear that we all have much to learn about our bovine friends. 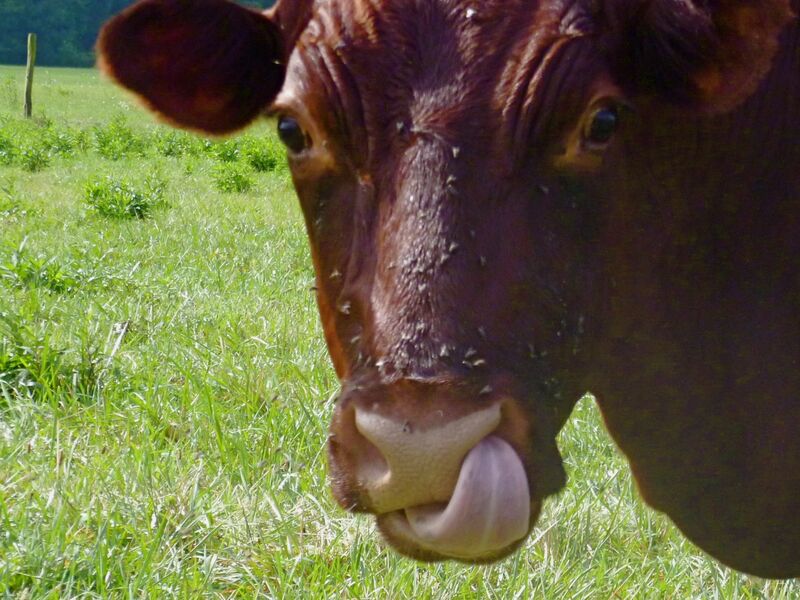 This is a funny one that caught me by surprise: cows clean their noses with their tongues! The first cow in America arrived in Jamestown colony in 1611. Until the 1850’s, nearly every family had its own cow. A cow must have a calf in order to produce milk. Today, one cow can produce the milk that it once took 10 cows to produce. Any cow lovers with other oddball facts? We’d love to hear them in the comments below. It’s been a crazy week here… still not so organized after all our moving around, and we’ve been invited to be a part of Mother Earth News Fair in Seven Springs this weekend. Our presentation is Sunday afternoon not that I’m panicking or anything. Hope to see you there! Oh my gosh. How very little I knew about cows until reading this. No upper front teeth? Yes, the girls are literally Hoovers shoveling it all in with those powerful tongues of theirs. The one I found funniest and most surprising was the licking clean of their noses – it’s comical to see. There’s a lot we don’t know about cows and I certainly didn’t do much here to correct that, lol.